Here Mary has been told of God's plan and as any of us might do she questions the viability of the plan. Such a familiar question, isn't it. It is for me. How many times have I been in the midst of making decisions that would please God but they just don't make sense to my worldly mind. The answer given to Mary's question is, 'nothing is impossible with God'. Mary's response to the answer she was given tells me she was not only acquainted with it, but had spent her life learning to live what it says. How many times does God present what appears to be an impossible solution to a problem in our lives, or reveal a life path that just doesn't line up with common sense plans we have made for ourselves? As you think about that, also try to remember how often your immediate response (key word...immediate!) was "OK. I'm your servant. Your' the Master. I'm doin' it Your way even though I don't understand it."? Mary teaches us so much in this simple response to this impossible plan. It really boils down to her submissive acknowledgement that she is God's servant. Does the work requested of the master without question. Works in all things to please the master, not herself. "no one tells me what to do with my life" / or we feel compelled to tell them how we think it can be done better. I realize that we are not all as extreme in the prideful examples above, but if we pause for a moment and honestly examine our past 'servant like' responses, we will probably find more resistance than submission. And remember, Mary only asked one clarifying question and then immediately submitted her life, will and body to the plan of God. 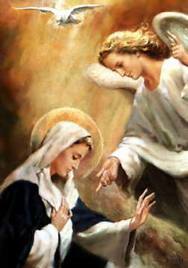 Mary's response is a perfect example of a servant recognizing her true Master. The world tells us to stand up and make a name for ourselves; take control of our life plans and do what it takes to make them happen. Mary had plans for marriage and a normal family life. She let go of those plans to be replaced with God's plan. The world's measuring stick for success is fortune and notoriety. Mary submitted to a plan that brought her shame as friends and family began to gossip about the circumstances of her pregnancy. Mary submitted to a plan that put her in a 'barn' giving birth in pauper like conditions. But her godly submission (not just doing what God says but doing it with the right attitude) resulted in a world changing event. Maybe God is not calling us to do something that will change the world, but it might be a plan that could change our life if we will just have the heart response of a servant to his master. And who are we to say if God's plan for us will have world changing results or not.